It’s that time of year again. As winter rapidly approaches a frosty London (snow in October? ), the ghosts and ghouls come out to play. Halloween is here again. Having its origins in the ancient Celtic festival Samhain, it was originally a celebration of the end of harvest. A time when animals were slaughtered and food stocks gathered for winter supplies. It was believed that on October 31st the boundary separating the living and the dead dissolved and the dead became dangerous, spreading sickness and damaging crops. During the festival large bonfires were made into which the bones of slaughtered animals were thrown. Participants wore costumes and masks in an attempt to ward off the evil spirits. 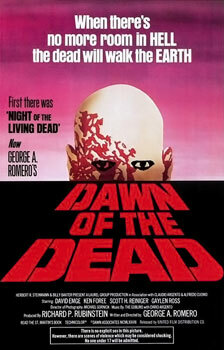 Time also to remember one of the classic Zombie-horror films, Dawn Of The Dead by George A. Romero. In this brilliant and very funny piece of low budget film-making a small band of survivors are trapped in a huge shopping mall full of the walking undead. Romero is able not only make a very scary film but also to draw some uncomfortable parallels on modern consumer-driven life; the zombies walking wide-eyed around the mall, gentle muzak in the background placating them. The film also features great music by veterans of Italian Horror movie soundtracks and masters of prog-rock, Goblin.